P Gallacher, C Wilson, B Jones. Tumorous Calcinosis an Unusual Case of Olecranon Bursitis. The Internet Journal of Orthopedic Surgery. 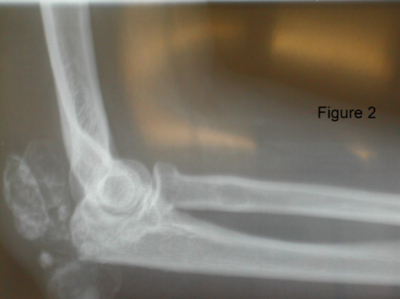 2007 Volume 9 Number 2.
of the right elbow consistent with olecranon bursitis. Her past medical history included the genetic condition Tumorous calcinosis which is an extremely rare genetic condition characterised by hyperphosphatemia, elevated serum 1,25 dihydroxyvitamin D and peri articular tumorous calcifications. This is a different clinical entity to the calcinosis seen in renal failure patients. She was treated with surgical excision and made a full recovery. We discuss the pathology and management of this rare condition. A 49 year old lady presented to the accident and emergency department with pain and swelling of the posterior aspect of her right elbow. The symptoms had initially begun two months previously. Over the preceding fortnight she had developed severe pain, swelling and erythema over her right olecranon with a decreased range of elbow movement. There was noted to be a past medical history of tumorous calcinosis requiring previous shoulder and elbow debridement 10 yrs previously. On examination she had a tense swelling of her olecranon bursa with associated erythema (Fig 1) and a reduction in flexion and extension of the elbow but no restriction of forearm rotation. 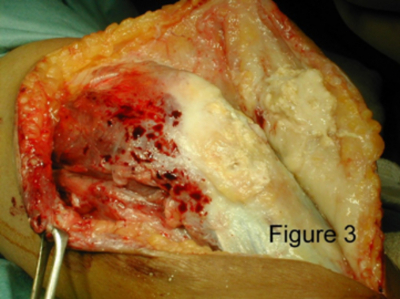 Plain radiographs demonstrated multiple calcified lesions in the triceps tendon and surrounding tissues (Fig 2). The patient was taken to theatre and the elbow was explored through a posterior incision. The ulnar nerve was identified and protected throughout the procedure. Interoperatively the olecranon bursa was found to be inflamed and infiltrated with calcified tissue (Fig 3), which was excised. Tumorous calcinosis is a rare autosomal dominant condition with variable penetration 1 affecting approximately 100 people worldwide 2 mainly of African descent 3 and is a separate entity from other forms of calcinosis due to renal failure or parathyroid dysfunction. It is characterised by disorders of phosphate and calcium metabolism. The clinical features include renal dysfunction and skeletal complaints and the condition normally presents within the second and third decades of life 2 . Tumoral calcinosis was first described in 1898 by Giard 4 and was named in 1943 by Inclan 5 . Previous cases affecting the knees, hips 6 and spine 7 have been reported. The condition causes calcified masses to form near to and within joints and can cause pain and loss of function. The only previous case described around the elbow involved the biceps tendon. 8 It has also been described as a rare cause of carpal tunnel syndrome at the wrist 9 . Tumorous Calcinosis is a rare genetic disorder that has musculoskeletal manifestations that may lead to unusual presentations of joint pain and swelling. The presentation can mimic common disorders such as infective bursitis/ septic arthritis but the calcified deposits can be easily seen on plain radiographs. The surgical excision of these calcific lesions can lead to a resolution of symptoms. 1. Lyles KW, Burkes EJ, Ellis GJ, Lucas KJ, Dolan EA, Drezner MK. Genetic transmission of tumoral calcinosis: autosomal dominant with variable clinical expressivity. J Clin Endocrinol Metab. 1985 Jun;60(6):1093-6. 2. Polykandriotis EP, Beutel FK, Horch RE, Grunert J. A case of familial tumoral calcinosis in a neonate and review of the literature. Arch Orthop Trauma Surg. 2004 Oct;124(8):563-7. Epub 2004 Aug 31. 4. Giard, J. M : Sur la calcification hibernale. Compes. Rend. Seanes. Soc. Biol. So. 1013-1015, 1898. 5. Inclan, A.; Leon, P.; Camejo, M. G. Tumoral calcinosis. J.A.M.A. 121: 490-495, 1943. 6. Kumaran MS, Bhadada S, Bhansali A, Shriram M, Kumar B. Young boy with multiple periarticular swellings and discharging sinuses: tumoral calcinosis. Indian J Pediatr. 2004 Dec;71(12):e74-6. 9. Ikawa H, Hashizume H, Inoue H. Carpal tunnel syndrome induced by two types of calcium deposition. Acta Med Okayama. 1997 Dec;51(6):333-7. 10. Martinez, S. Tumoral calcinosis: 12 years later. Sem. Musculoskeletal Radiol. 6: 331-339, 2002. 11. Verma S, Bhansali A, Gill SS, Kumari S, Singh S. Periarticular 'hard tumors' in soft tissue. Post Grad Med J 1999; 75: 492-495.